The blogosphere has been all abuzz for months with the antics of a mysterious anonymous presence known as The Whisky Sponge. This satirist writes with razor sharp wit and a dark palette (not palate - although maybe that too). The Sponge's target is the whisky world - particularly the puffed up, self important, bombastic, money grubbing, success oriented, and just dissipated parts. No personage is too esteemed, or (apparently) too trivial for The Sponge's depredations. Time and again these posts are repeatedly laugh out loud funny. Raucously hilarious, in fact. In the dark and often murderous and cannibalistic details of The Sponge's brilliant satire the comparisons with Swift are unavoidable. This stuff is so good that it almost veers into the terrain of literature - except manages to stay on the side of trashy fun. In the blogosphere and social media channels of the Scotch whisky world this new comedy blog has hit with the impact of an atomic bomb. People speculate endlessly about the identity of this phantom. They also joyously post and discuss when their rivals are skewered - and twice as vigorously when they or their friends are roasted (and that's what is going on here, if you haven't picked up on that already, oh swift one). Pity The Sponge's primary targets, a few listed at random here out of the many many options: poor Blair Bowman (pierced as "Blow Hairman"), Victor Bagging Brierley (mangled brilliantly as "Victoria Shagging Barfly") Ralfy Mitchell - always presented as himself, Ian Buxton (who is abused as the hardly disguised "Liam Buxton"). Yes - these are all live links to various hilarious Sponge posts. This is just the tip of the iceberg. There are dozens of named references that are probably too inside for me to get - Yankee that I am. "I have grown weary of the ceaseless posting of Whisky Sponge blog posts to this group (and to every other group and page I frequent across the wide Internets). I tire, too, of the ceaseless fawning praise of The Whisky Sponge - even while, granted, I'm among the most egregious offenders. However, the latest Sponge post specifically skewers whisky bloggers and had me literally laughing out loud at least half a dozen times while reading it. It (the Sponge) ends by skewering the concept of the #WhiskyFabric itself. I practically wet myself. It is necessary to post a link to it here: http://whiskysponge.com/2013/10/08/whisky-bloggers-to-be-culled-confirm-scottish-government/ Now, any time, someone satirically suggests mass murder it's almost impossible not to make a comparison with Swift. And, indeed, this is positively Swiftean. But after I stopped laughing I became angry and now vow vengeance. I suggest we all begin using natural sponge in the shower. Time to kill some of those buggers off..."
I should be outraged - and INDEED I AM. But also, oddly, tickled pink that the VICIOUS EFFING SPONGE even knows I'm alive! I WILL HAVE VENGEANCE. But for the life of me I have no idea how. I certainly can't engage in satire. That would be like stepping into the ring with Mike Tyson. And, of course, even here The **EFFING** Sponge is mocking me - because I have publicly expressed desire for a taste of 1964 Bowmore for my Birthday next year (when I turn 50) - as 1964 is my birth year. The Sponge mocks me with the highest rating being not for the vaunted Bowmore Black, White, Gold, Fino, or crazy $14,000 crystal decanter one... but for the EFFING 1966 Samaroli (which might as well be a unicorn anyway - and isn't a 1964)! And, is it possible that The Sponge knows my secret weakness for Bell's - and even deeper weakness for hyper-mature Inchgower (the primary component of Bell's)? Many of my recent dramming partners know this - but I've never written about it on this blog. Is its network of spies that deep? What can I do? You can always go the direct route, i.e. run that Whisky Sponge through the dishwasher on a pot scrubber cycle two times. That'll teach that filthy Whisky Sponge who's Boss! Give em hell Josh! This is the best suggestion yet - utterly lame as it is. The Sponge is physically located in neither time nor space. There seems to be no pinning it down. There's no shame in loving Inchgower. No matter how one "loves" it. Ooooh! See, now I have to "get" you too! Get over yourself, your name was last on the Sponges list of derision. I doubt the sponge gives a monkeys what you think - just another parasite. Incidentally - how much did you get paid to wear a 'smooth ambler' shirt with a green rabbit pinned to it? I am, sadly, over myself, friend. I was honored to be skewered by The Sponge - so sue me. 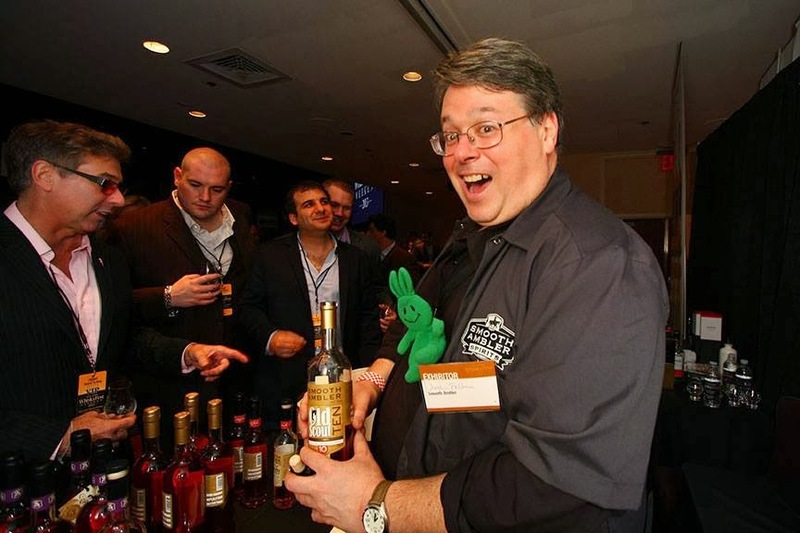 I wasn't paid to pour Smooth Ambler - but it got me into WhiskyFest for free (but I worked hard). The green rabbit is the symbol of Greenie McGee - an NY whisky personalty. No money involved. Just friends and good whiskey.